It was only the day before yesterday that the rich democracies imagined a post-cold war global order fashioned in their own image. Now they are running away from the world. There were to be three pillars to the new order. As a benign hegemon, the US would underwrite the international peace and advance the spread of liberal democracy. Europe would export its model of postmodern integration to its near neighbourhood and beyond — remember those predictions that the Association of Southeast Asian Nations would soon be like the EU? A declining Russia would join China and the rising powers of the east and south in recognising their national advantage in becoming stakeholders in a western-designed system. That was then. The US is still by a margin the pre-eminent power but, whether Hillary Clinton or Donald Trump wins the presidency in November, the domestic political impulse is to pull back from the world. Europe is too busy filling the cracks in its own project to pay heed to what is happening elsewhere. Engulfed by crises — the eurozone, migration and most recently Brexit — it is a continent that has lost the capacity to think strategically. Meanwhile, China and Russia have no inclination to accept rules written by the US. What happened? The war in Iraq, intended to demonstrate the reach of American power, instead delineated its limitations. The global financial crash of 2007-08 cruelly exposed the weaknesses of liberal capitalism. Europe’s integrationist dreams were shattered by the consequent eurozone shock. China grew a lot faster than anyone had expected, accelerating the redistribution of power in the global system. The common thread now is nationalism. In the US this takes the form of “America-first” — some say, belligerent — isolationism. For Vladimir Putin, armed revanchism is about all he has left: Russia is weak in all the dimensions of power except the military. Europe, with its populism and pocket-sized authoritarians such as Hungary’s Viktor Orban, is unlearning the lessons of its history. China wants to expunge the memory of 100 years of humiliation. You could say they are all Westphalians now. I was reminded of the gulf of misunderstanding and mistrust at a gathering this week in Beijing. The annual Xiangshan security forum is the place where China’s military and political elites speak to the world. It is a fascinating event for a westerner — a place where the voices of Europeans and Americans have to compete for time at the podium with those of such nations as Timor-Leste, Cambodia, Mongolia and, of course, China’s ally of convenience, Russia. The chosen theme for 2016 was the search for a “new model of international relations”. The subliminal message was that the west should recognise that the old order has passed and it is time to engage with China in co-designing its replacement. Western talk of adapting the existing system to accommodate Beijing failed to recognise that what is required is something entirely new. Above all, the US, as the status quo outsider in east Asia, should adjust to the new realities. The alliance system of the second half of the 20th century does not fit the geopolitical realities of China’s rise. Apart from some sharp words about Beijing’s resolve to protect its claims and interests in the South China sea, the language of the hosts was mollifying. China seeks positive sum co-operation and is determined to avoid the “Thucydides trap” of a clash between an established and rising power. But the new order cannot look like the old. Like what then? You catch talk in the background about a new concert of great powers, modelled on the work of Metternich at the 19th-century Congress of Vienna. Or perhaps a series of regional power balances with the US and China at the apex? A less sanguine view is that order will simply be replaced by half-organised disorder. There yet is another school of thought — call it realism, pragmatism or, more realistically, fatalism — that says there is simply nothing to be done. Later, if not sooner, this multipolar world will find a new equilibrium. Let nations sort out their own problems and conflicts, proponents of this view argue. A new balance will eventually emerge. The snag is that eventually may be too late. The Middle East is burning and Russia wants to upturn the post-cold war settlement in Europe, but the really dangerous great power flashpoints are in east Asia. Add North Korea’s nuclear programme to regional rivalry in the East and South China seas and it is not hard to see US-China competition turning to confrontation and worse. The world is at a hinge point. 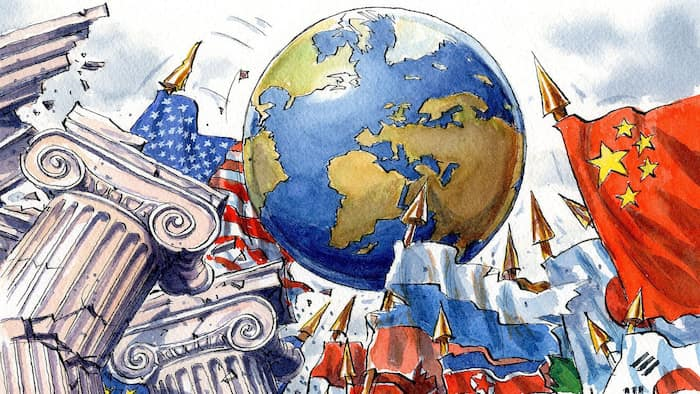 The post-cold war settlement, organised around unchallenged US power, western-designed global institutions and multilateral rules and norms, has been eroded. The rule of power is chafing against the rule of law, nationalism against internationalism. Some think that the simple fact of economic interdependence will save the day — conflict would throw up only losers. But the dynamic can operate in the other direction. It is no accident that the International Monetary Fund’s latest annual report cites political risk as the biggest threat to the world economy. The liberal economic system depends above all on global security order.